The same lift pylon and terraced yellow (orange) lodge at top of slope can be seen on the right side of this photo, too. So, they are correctly scanned. Not reverse. 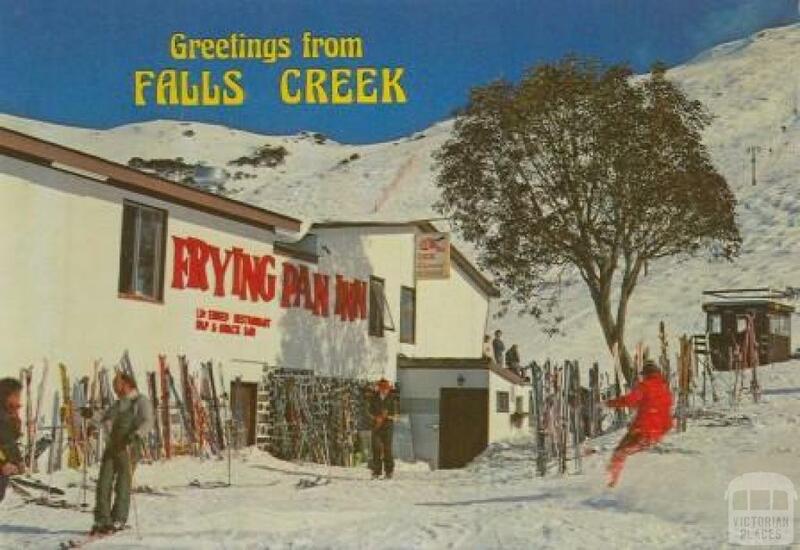 Diana lodge on the lower right, with the area in front with access to the Gully Chair, before the Sundance/FCCC was built. Ticket office in at bottom there somewhere as well. The burgers at the old Lions Hut (?) as I recall were excellent, though I think that appeared later. VSG and Duck of Snow....many thanks for these excellent shots. Shows the Frying Pan in its heyday, when it really was worth getting into and it rocked. JonthePom...Lorna...think you are absolutely right about that. 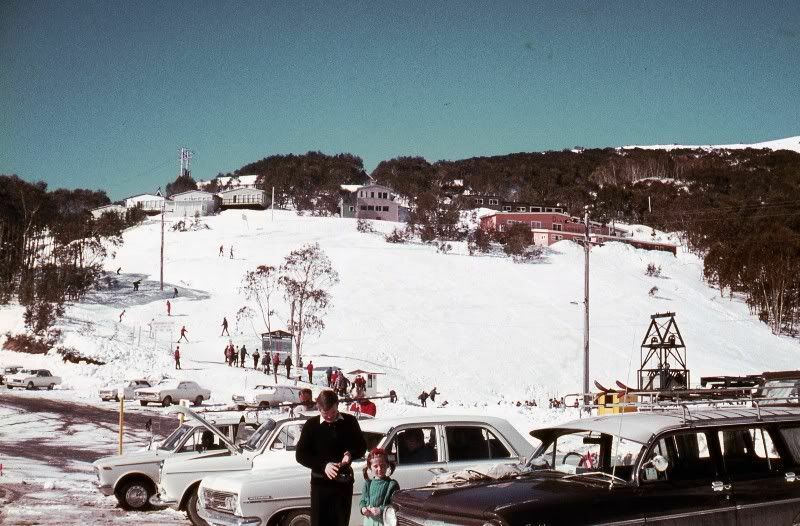 The bowl area was, and still is I think, the best location for ski school and beginners. 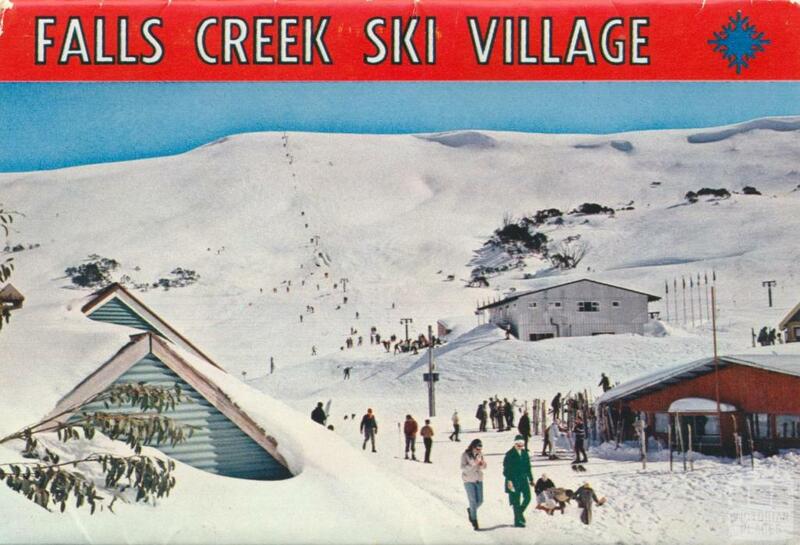 It offers shelter you get very rarely elsewhere in Australia and certainly not at Hotham. Makes for a much safer and better intro to skiing for new skiers. After they can head over the hill I would argue. But with the mountain focus now around and up near the plaza etc I don't think that will happen. Interesting to see the area where the Motel would be built. That is what, maybe 42 seasons ago now I think (!, sheesh). Marg Old Diana Lodge, Mufts, Apresski and 1 other person like this. Note in the pics the delightful lack of infrastructure, associated crap and.....trees. Just makes for a better ski I reckon (cue Greenies). .. and the girl in front of our station wagon is my sister. She broke her leg skiing there one year back then - may have even been that trip. .. and the girl in front of our station wagon is my sister. She broke her leg skiing there one year nack then - may have even been that trip. Yes, it was cosier to have everything going on in the Bowl but it soon became so over-crowded around the Baby Poma.....and a generation of skiers could only turn right! It only took one right-hander and you were safely snowploughing down past Nissen, back to the lift. By the time we doubled up the Poma and added the Mitey Mite.....it was getting a bit silly. Space apart, I guess the new development 'up top' is all about access to water for snowmaking. The Village T-bar was always there to graduate to! Mind you I hated village and gully for years. Lessons started at about 9:15. It was usually concrete and often ungroomed. Instructors always made us do a run or 2 there while the lower level classes went up Eagle first. Well, yes there was that! Made you stronger though. Geez those late afternoon waits on the Sun Valley T were no fun. Finding a sneaky bush or tree when up the top was usually on the cards. Harder for you no doubt. currawong and TC like this. Marg Old Diana Lodge and Karicta like this. ASB, JonthePom, Bogong et al ...keep it coming - pics especially. I must see if I can get my old man's snaps of FC in the 60s/70s - I'll try and get them posted up. Tecks - you have the right years on the motel(hotel) - I'm guessing it was built 72/73 (mainly summer). Glen Docking would have the detail. 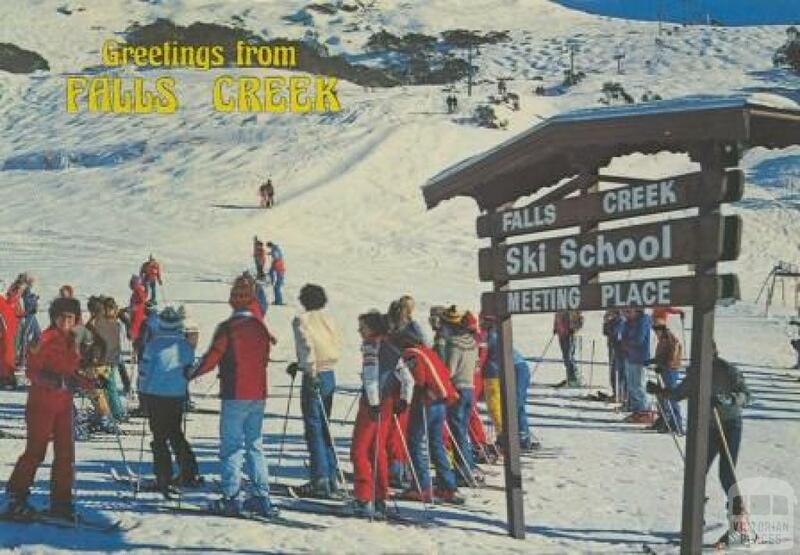 Does anyone have a bit of history on Cumings Ski Hire? AS...sorry that name doesn't ring a bell...John must have been there after I left - or my memory has gone. I still see Flea and John regularly, they live in Armadale too. We owned a flat in Snow Crystal and John rigged up an intercom between our flat and theirs, so I could listen in on the kids sleeping! They had some outrageous dinner parties. By the way, they have been married for years. Indeed. And the jump on the other side next to the Village T-bar machine house. When did Cummings ski hire shut up shop proper? By the way is Gebi's still operating? Great to here, John et Flea finally got married et still living in Armadale, their dinner parties were off the planet, I remember talking to John the following day and he say " Greg, did I have a good time'' Are they in the Melbourne book? also was it Johns unit or Al Pals that had the hole in the wall, that was the spare bedroom, sleep their once, different. I'm not at home at the moment, but I'll pm you their address and phone number later today. It was Flat one, the management flat, used to stay there before we bought a flat. After John and Flea, it was Lyn and Normie Martens flat when they managed the building. Gebi's was bought by the lift co quite a few years ago. They ran it for a while, initially as a different style of shop with a good manager but then it became just one more of their ski hires. Eventually they pulled the pin on it all together. The apartments are still there and I think a commercial laundry operates out of the basement. Gebi still lives in Mt Beauty for much of the year, and in Tyrol for our summer. Can't recall how long ago the lift co took over cummings - quite a while ago. It was warm sunny day, bright blue skies, queues were short for the summit t-bar, so we all jumped on, and away we went till the tow stopped, so as you do, look over your shoulder at the powerhouse, it seems all fine down there. Next moment we were deposited ever so gently into the snow on the tow line. Looking up towards Eagle Rock, ah there is the problem, a tower had fallen over into the snow like us. So we all picked our selves up and continued skiing other runs. That night, all night, Mike and his crew worked their guts out, next morning by opening time, the tower was up right, the cable was strained, AND they even repainted it. For the next few days that crew never bought a drink for themselves. Mike and his wife Jane, and baby Amber, wonderful falls creek residents, not so the bloody cat, a Russian blue point named, IIIya Kuryakin, but that's another story for another day. Marg Old Diana Lodge, Karicta and Karbon like this. Marg Old Diana Lodge, Kletterer, Karicta and 2 others like this. Sorry, didn't realise. These were all part of an album FC put on FB yesterday, I just copied the lot of them. 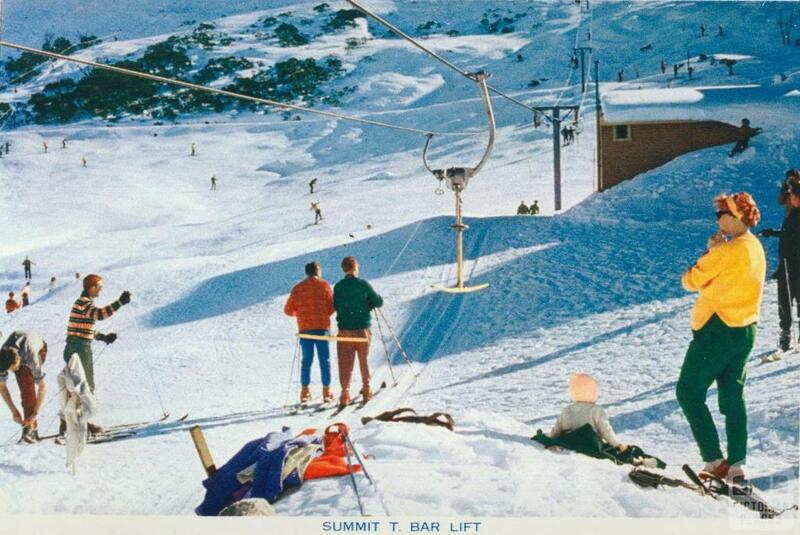 That old Summit lift made you earn your turns on the way down. Bumps all the way. The most painful injury I've had while on the snow was when someone sharing fell off on that T bar on the way up, and then the bar ended up around my kidneys with the end broken off. Jagged plastic pierced all my clothing and I bled like a stuck pig. You sucked it up. Interesting to see the old pics and one of the first thing I noticed was no padding on the towers. If you hit one back then, well, you just didn't. Excellent photos. A real Frying Pan. A proper ski hire and limited trees....as God meant it to be!! The lady skiing outside the mini-mart appears to be wearing a helmet - what a trailblazer! That is a big, boofy, furry hat. She probably has apres boots that resemble small furry carnivores devouring her lower limbs. Bit of a ski lift nerd comment but I notice the 'wheel assembly' on the first tower of international has changed. It's now more of like a drum. Perhaps there were issues with the old setup derailing perhaps....?! So very very very sorry to hear of the passing of GIBBO, yesterday. Will be so sadly missed by all. the " QUEEN of the Hill "
Wonderful pitcures VSG......could have been taken in 1970! Likewise with the memory pill/Scotch deficit problem, BK, I'm trying for the life of me to remember the name of the family at Diana then? Just the one teenage daughter - and maybe a younger son? - who used to do odd days during the holidays for Alpine'. Big Al rings all sort of bells......but no immediate image forms. Hi JonthePom..... John & Gwyn van Burck - Daughter - Me.... Margaret, brothers Ed & Chris... were the family from Diana ALL those years ago.... FC still holds a big part of my heart! Austrians were pretty thick on the the ground then. Zigi & Renata Haberzetl (sp?) ran the ski school, Joe (Reitner I think) was the (moody) brains behind the cats' cradle of telephone and lift control wires that preceded workable radios. Walter ? at the Frying Pan. Walter (Wally) Erlacher at Alpine then Koki. "Big Hans" Fischer at Koki.....he may the one who went back to the lifts after I left? teckel and currawong like this. JP - Hans Fischer it was.....well done. The family that Diana Lodge (still do?) were at Swan Hill as I recall. Maybe ASB can help out on this one? Coming home on weekends and returning to Albury every Sunday with some of the Army guys from Bandiana. (my Mum would say... they are such lovely young men & I trust their driving.... little did she know of their antics on slippery roads... like driving with their headlights turned off..... trying to make the quickest time down the mountain etc!). My family John & Gwyn van Burck, with two of my brothers Ed & Chris) owned and ran Diana Lodge from early 1967 until roughly 1978 - Diana was then sold to a group of people from Swan Hill. Mum & Dad also had a unit at Kilmanjaro, which they eventually sold. Mum & Dad moved to the Gold Coast about 1980. I miss the Creek.... loved the winters and summers... enjoyed my teen years there, skiing in winter and motor bike riding, trout fishing and the solitude in summer! i have just recently caught up with (on social media) Denis Cumings... I'm sure he has some stories to tell! I'm frantically looking for 'old' photos... i will attempt to upload a couple of the snow 'rolling' off the roof at Diana, i think the photos are from 1974-75 and October 1969.
stansi and Apresski like this. Lorna on the far left? My Dad above the clouds on his beloved Polaris! Dad on the Raceline riding his beloved Polaris. The Bowl - late 60's - Mr & Mrs Mulray, Mum and Doug Mulray before he became 'famous' on the telly! Part-ay at Diana Lodge late 60's L-R (not certain), Mum & my brother Ed. Christmas 1969 - Mum, Harold Cumings (?) & Gail Anderson near Rocky Valley dam - my cousin still has the Vee-dub....! !